Releases on 03/05/2019. 11 Days left to Preorder! 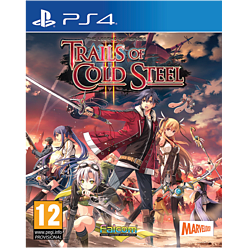 Receiving the same HD remaster treatment as Legend of Heroes: Trails of Cold Steel on PlayStation 4 featuring 4K/60 FPS support, turbo mode to streamline gameplay, and for the first time on console, the option to play with the original Japanese voices along with approximately 50% extra lines of English voice-over dialogue. The Legend of Heroes: Trails of Cold Steel II picks up just one month after the decisive collision which changed the fate of the entire nation of Erebonia. Players can continue Rean's journey as works tirelessly to right the wrongs that have led the country to disarray. Recruit Thor's attendees that are scattered across the country to gain shops, goods, training modes, systems, and the Trails series' highly celebrated colorful dialogue."